The party really got under way when the dancers arrived! These girls really know how to shake it! 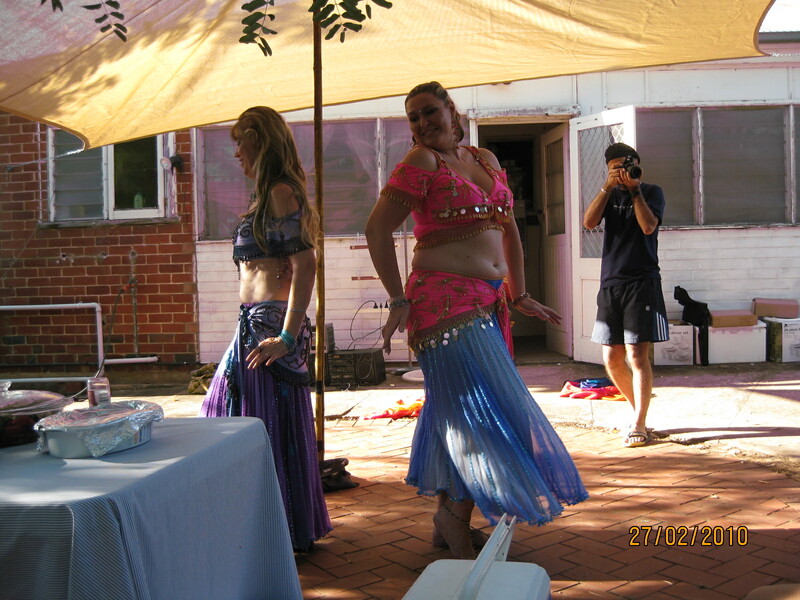 This dancer’s claim to fame is playing a fairy called ‘Columbine’ in the Aussie TV series, “The Fairies”. If only you could see how she was shaking those hips! I could watch this girl dance for hours! It was a hot Sat’dee arvo, but the kids had a ball playing in the pool. My young musician friend rocks the party! A happy Baha’i New Year to all my readers! A couple of weeks ago I was privileged to attend a party in celebration of the Baha’i ‘intercalary days’. These are the ‘leftover’ days at the end of the Baha’i calendar and are celebrated much the same as we celebrate the New Year, but with little, or no alcohol… The celebration was a real family event, and all the kids had a ball playing in the pool while the adults sat around eating all the wonderful food which was provided by the hosts and some of the guests; chatting and generally enjoying each others company and a pleasantly warm afternoon. These are genuinely very friendly people and I had some very pleasant conversations with people I’d never even met before. The party’s entertainment began with the dancers in the pictures, whose names I sadly omitted to ask (Jeez, I’d never make a journalist! I must try to do better next time!). This was followed by my young musician friend, whose name I have difficulty remembering because I have difficulty pronouncing it! After this I played a few songs myself and finally, after dark, we ate corn on the cob, Persian style: roasted over a bonfire in the garden then dipped in saltwater, before gifts were given prior to everyone going home. Now there was a significant difference in the gift giving… all gifts were provided by the host, Farhad, who made sure nobody went home without one! I scored a nice new soldering iron! After the intercalary days, the first month of the Baha’i year is their month for fasting; this is essentially the Baha’i version of Ramadan, and a reminder of their Islamic origin. I can’t say too much about it except that eating and drinking are taboo during daylight hours for this month, although there are allowances made for age and infirmity, and pregnant women are also not obliged to fast. All in all, a good time was had by all and I must say that Baha’i parties are undoubtedly the most peaceful ones I’ve ever attended!